Through infinite layers of sound, buildups and subtle audio hints, there is not just one world that is being portrayed through this album, but many musical worlds that share roughly the same space, and phasing in and out as I listen to their vibrating echoes. This is not just an over imaginative metaphor. As I try to grasp what I am listening to I am seeing so many sights that it is impossible to stitch them into one landscape anymore. It begins with distant beacon through empty space, and as the unsettling drones glide forward through the dark ether, I suddenly see more. Pagan chanting and dark, dense branching appear, while hot, deserted landscapes are erased. 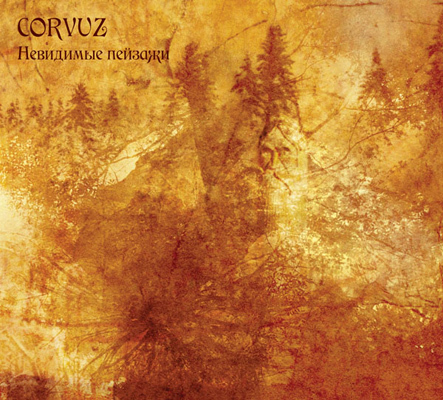 Even in its most disturbing peaks, Corvuz keeps caressing the listeners with soft, almost reassuring music. It is actually pretty admirable how deep and eerie this album can get while staying within the physically calm area of soundwaves. Tales are being told through long strokes of music, and a painful, multifaceted picture is being drawn by this obscure artist. With every track being a portal or a pathway to a whole set of rules and notions, this sums up as another great album that is available through Zhelezobeton. It’s not a surprise, but it’s a golden opportunity to recommend another album from its arsenal.